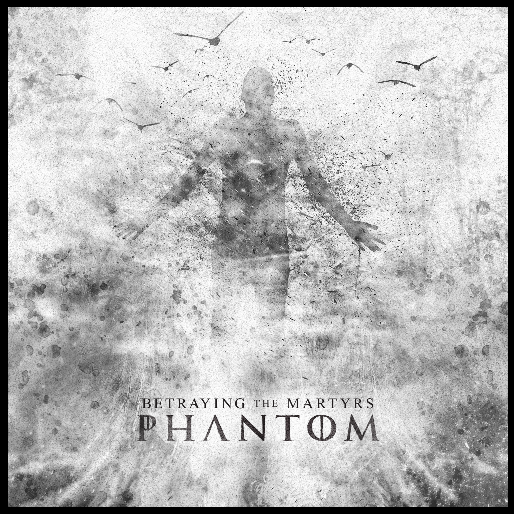 When I first heard the name Betraying The Martyrs back in late 2012, I didn’t really pay much attention to the band. In early 2013 I saw them live for the first time and their energetic live show convinced me to give their debut album Breathe In Life a chance. I haven’t regretted it to this day. I saw them again a bit later that same year and if anything, their stage presence had improved further. Naturally I was very excited when the guys announced that they were working on a new album, and when Phantom was finally released on July 15th, I was blown away by the result. The sextet from France, which features a singer from the UK and a drummer from Russia, has a very distinct style that is easiest described by a made-up term: epic metalcore. Let me elaborate: the technical level of the musicians is very high and the arrangements of every song just have a purely symphonic feel to them, while still being relentlessly heavy. The heaviness is assured by the very low, B tuning I think, guitar sound and crushing riffs, coupled with the almost robot-like precision of the drumming. To be honest, I could write a paragraph each about the skill displayed on every single instrument. But I’ll condense it a bit: the drummer is, in my opinion, one of the best in the genre despite his rather basic drum setup. The groove that this guy unleashes is just pure insanity, coupled with the above-mentioned tightness, speed and a mind-blowing amount of fills, it’s just a pure joy to listen to the forty-four minutes of madness. The guitarists are in a similarly awesome sphere of grandeur, since their feel for melodies coupled with neck-breaking parts is eargasmic, yeah I just made that word up. Another very atmospheric layer is added by the keyboards, which are featured prominently but not to the point where it sounds like one of those electro-core bands. To top it all off, the production is exactly what I think a modern metal record should sound like: a clean but ear-drumming sound, which does in some places border on the over-produced but manages to walk the fine line between a genuine and a tweaked sound. If BTM were an instrumental band, the thirteen songs would already be close to perfection at this point but they feature dual, triple during some choruses, vocals…so the epicness continues. The cleans have two major things going for them: their very skillful handling of melodic singing and something I just love, on a personal level: the very distinct Frenglish accent. The unclean parts cover pretty much every aspect of the spectrum, ranging from growls, to deeper growls, to even deeper growls, as well as screams and a few screeches for good measure. The small cherry on the pie are guest vocals by Gus Faris of Volumes on the track Phantom (Fly Away). If by now I haven’t managed to convince you to give Phantom a shot, let me just finish off by saying that they covered a song from the Disney movie Frozen, which you can listen to below. While it sounds a bit ridiculous on paper, it sounds incredible when played and shows off the band’s sound perfectly while still maintaining the feel of the original song. This second record should be in every metalcore fan’s collection, since it will keep you entertained for hours on end, trust me. You can find more info about the band and their busy touring schedule on their Facebook page. Enjoy!